When people hear visual merchandising they typically get nervous and uneasy. They know it's an important retail term, but not sure exactly what it is or how to do it well. It can create uncertainty about where to start. If you’re artistically challenged and financially deprived, creating visual displays can be especially difficult. 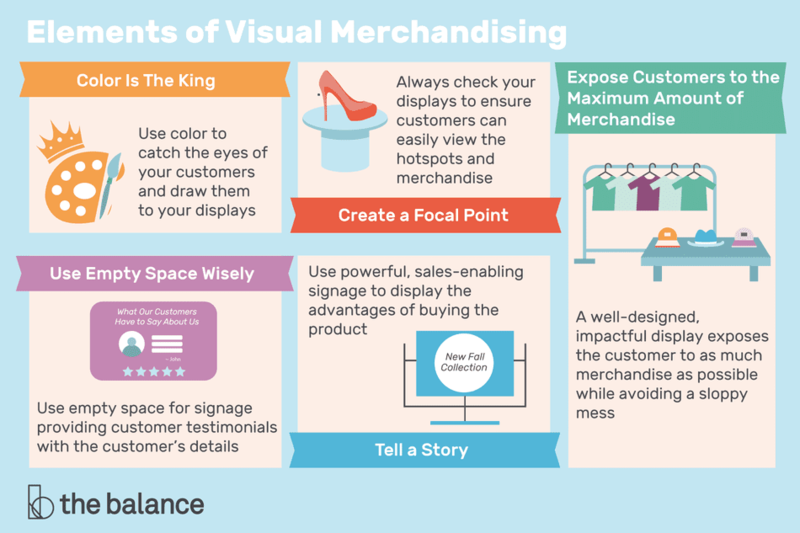 But here are the five most important elements of visual merchandising. They are easy to implement and won't break the bank and, most importantly, they will increase your sales. Strong visual merchandising has a huge impact on customer experience in your store. Whether you're revamping your retail displays or creating new ones, use these five strategies to help you achieve more impactful and memorable visual merchandising. And put more money in your pocket this year. Color is powerful, and it can make or break your visual displays. A retailer might create an erratic display, but if the colors coordinate well, the display can still be a success. Consider using contrasting colors, like black and white, and monochromatic colors--both create intriguing, eye-catching displays. Too many times we lose sight of the power of color and its ability to attract the eye. Consider your home. You probably have a solid grey or brown couch, but there is a "pop" of color from the throw pillows you place on the edges. This is the same principle. Remember: wherever the eyes go, the feet will follow. So use color to catch the eyes of your customers and draw them to your displays. Where does the viewer’s eye focus on your display? Do their eyes move toward a specific location on the display? Or are they confused about where to look? Create a hotspot--or focal point. Why? Because hotspots can increase sales by 229 percent. Examine your display from the customer’s point of view: the top, the floor, both sides. Often the focal point is positioned too high for the customer to see. Always check your displays to ensure customers can easily view the hotspots and merchandise. Remember, the hotspot is the product, not a visual element you use to add to the story. By this I mean, if you put sand and seashells on the table as part of your sandal collection, make sure the sandals are the focal point and not the sand. What’s in it for customers? Tell them. Use powerful, sales-enabling signage to display the advantages of buying the product. Present three bullet points that tell customers why they need the product or how their life will become easier because of the product. Remember, you’re not writing an essay but rather a headline, powerful bullet points, and possibly a price proposition. By telling a story, you help the customer better understand the product and enable the buying decision. A display may lack a worded sign or an educational sign. That’s perfectly fine; as long as there’s still a story, the sign can speak for itself. For example, lifestyle graphics are very popular in telling the story. No words, but the image speaks volumes. A well-designed, impactful display exposes the customer to as much merchandise as possible while avoiding a sloppy mess. The more products customers see, the more they buy. Consider using a circular store layout, which many retailers use. It’s powerful because it exposes customers to more merchandise than traditional aisles. Where your store does use aisles, place a display in the dead center so customers are forced to stop and look at the products. Have as many displays as possible, and present as much merchandise as possible. But keep displays clean and sharp, and ensure aisles are spacious and barrier-free to prevent deterring customers from products. We used dining tables from World Market to create a visual impact. Displaying our shoes on these tables was kitschy and bold. It caught a customer's eye for sure. And we got many compliments on the display tables since the tables were unique and a story in themselves as opposed to the traditional display pieces stores use. There’s a space in all retail stores that is the most underutilized. It’s the section between the displayed merchandise and the ceiling. If this space in your store is empty, you need to start using it. You can use this space for many different things, like signage providing information about products or brands. You could display customer testimonials with the customer’s name and picture. You could profile a designer or supplier. You could also display lifestyle graphics that help customers make associations with your products. For example, a furniture store could display an image of a family cozied up on a couch, emitting those warm, fuzzy feelings that put shoppers in a good mood. A jewelry store could display a woman at a fine dining restaurant wearing a bracelet, creating an association between the store’s jewelry and a luxurious lifestyle. Visual merchandising is multifaceted, and retailers can choose from hundreds of ideas when designing displays. But these tips return the biggest bang for your buck. Use them to make your store as memorable as possible.